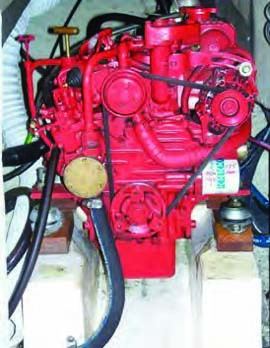 The charging system in most sailboats consists of batteries, alternator, voltage regulator and the connecting wires and cables. The job of the charging system is to replenish the batteries and to provide current to existing loads in the boat at the same time. The charging system does this by converting the engine’s mechanical energy into electrical energy through an alternator. It’s important to ensure that your alternator belt has the proper tension. When electrical loads drain the battery, the battery voltage drops. When the voltage drops below a certain level the voltage regulator tells the alternator to turn on and begin charging the batteries. So, the voltage regulator is a switch that turns the alternator on and off up to 12 times a second. When the batteries are low and current demand is high, the alternator will stay on longer. When the current demand drops as the batteries recharge, the alternator will freewheel and therefore charge less. Alternators use magnetism to generate electricity; passing current through a wire creates a magnetic field around the wire. Moving a wire through a magnetic field creates current flow in the wire. The alternator generates electricity by rotating a magnetic field in the rotor around a circle of stationary copper windings called the stator. The amperage created is determined by the strength of the magnetic field. The output of the alternator is controlled by the field wire that changes the current to the magnetic field in the rotor. One amp of field current will produce 30 amps of output current on the stator. Alternator belts are critical to the proper operation of the alternator. As a rule of thumb, a 12-volt alternator’s ratio of output to horsepower load is 25:1. If an alternator is producing 25 amps of power, it will apply approximately one horsepower of load to the drive belt. If you are thinking of upgrading your alternator to a higher amperage rating, remember that there are limitations to the loads that the belts can handle. A single ‘vee’ belt with a 3/8 inch width can handle an 80 amp alternator or approximately 3.5 hp of load. A single ‘vee’ belt with a 1/2 inch width can handle a 110 amp alternator or approximately 4.5 hp load. A double ‘vee’ belt with 1/2 inch width can handle a 310 amp alternator or approximately 12 hp of load. All alternators have a voltage regulator. The voltage regulator controls the amount of current produced by the alternator. This also controls the voltage in the boat’s electrical system. Most alternators have internally built single-stage regulators that control alternator output by switching the alternator off and on. The regulator senses voltage levels from the output of the alternator. When the battery voltage is low or below a pre-set level, the voltage regulator switches the alternator on, increasing the magnetic field to the alternator which increases the current output from the alternator. When the battery voltage reaches a certain preset level (generally around 13.5 volts,) the regulator will switch the alternator off. Most sailboats have larger battery banks and are always looking to cut down on engine run times to recharge their batteries. In order to get the most out of your existing alternator or if you are thinking of upgrading to a higher output alternator, adding a three stage regulator will maximize your output and cut down on the time it takes to recharge your batteries. These three stages are broken down to the bulk stage, the absorption stage, and the float stage. During the bulk stage, the alternator produces a constant current to the batteries. The regulator keeps the amperage high until the gassing voltage is reached by the battery. This means more amperage is being produced for the battery, cutting down on run time needed to charge your batteries. Unlike the single stage regulator, which tapers the amperage as the voltage increases. At the end of the bulk charging stage, the batteries have reached about 80 percent of their charge. At this point the battery cannot accept high amperage at gassing voltage. At about 14.4 volts, the three-stage regulator switches to the absorption stage and reduces amperage to natural absorption rate for the battery. Charging current at this point any higher than the natural absorption rate only generates heat in the battery and reduces its life. At the end of the absorption stage, the three-stage regulator will switch to float stage. At this point the batteries are at full charge. The regulator drops the voltage down to about 13 volts. When the voltage drops, the regulator will provide enough current to the battery to maintain this voltage. So the battery “floats” at this voltage. If you are thinking of upgrading your charging system, remember to increase the size of the output wire from the alternator to the starter. This wire should be able to handle maximum amperage from the alternator. Also, adding the same size wire and grounding the case of the alternator will help make the system more efficient. Next month we’ll take a look at your boat’s batteries, the various kinds/sizes available, and how to keep them charged properly and extend their usable life. Brad Williams is the Service Manager at Captain’s Cove Seaport in Bridgeport, CT.